Dead of winter, a couple hours before sunset off of Northern California. You hit the 50 degree F surf looking for some great rides in head high and better swells. Instead of an epic surfing session you are flushed by too strong a current far away from land. You paddle for all you're worth and then paddle some more to exhaustion, numbing cold and beyond. The guys in the lineup vanished below the horizon a while ago and there are no boats, lifeguards or anyone else that knows where you are. 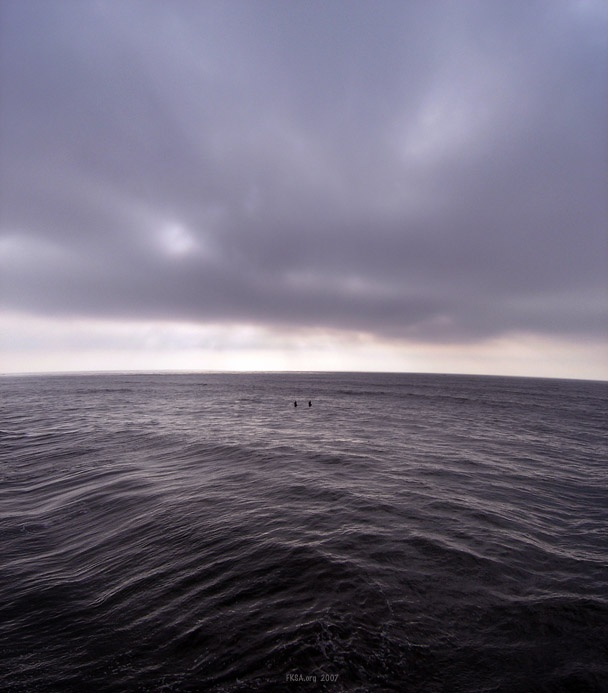 It's just you and your bud being dragged westward towards the Farallon Islands and the cold wet unknown. 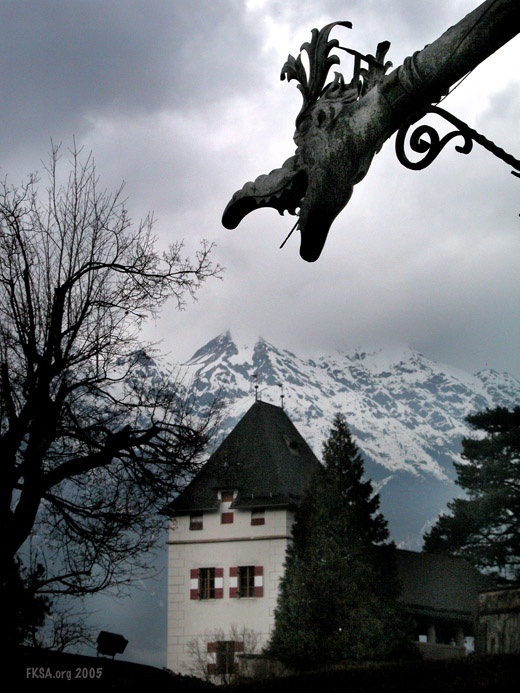 Dread and cold fear take over as your options sink away. You see something small and hazy in the distance moving slowly toward you from land. What is it ... ? This is a story of an impressive rescue, linking surfing and standup paddle surfing ("standup"). Both have been around for centuries with standup undergoing a rebirth. It involves Ray Deiter, a thirty year resident of Northern California and an avid waterman. Ray stands 6'2" weighs 220 lbs., is very active and just turned 60. Actually, Ray says 20 lbs. is taken up by his beer belly but considering how things worked out, I doubt that. He grew up over the decades longboard surfing in the 1970's, windsurfing in the early 90's, diving, sailing, whitewater rafting, kiteboarding since 1998 and more recently standup. Both his parents were lifeguards back in the day and his mother was competing for the USA Olympic Diving Team in the 1940's. That is until Ray decided to come along altering the direction of things. So, excelling in the water goes way back in his family. Age is relative, heart, ability and judgement can count for far more. The area looking eastward across the inlet and down the coast. 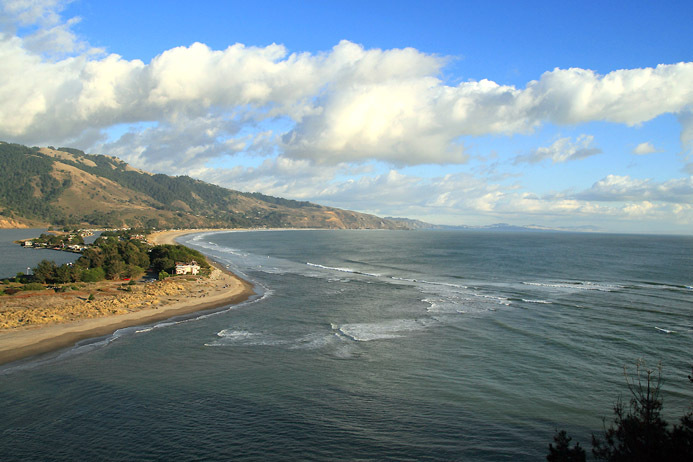 The setting was north of Stinson in Northern California just above San Francisco. 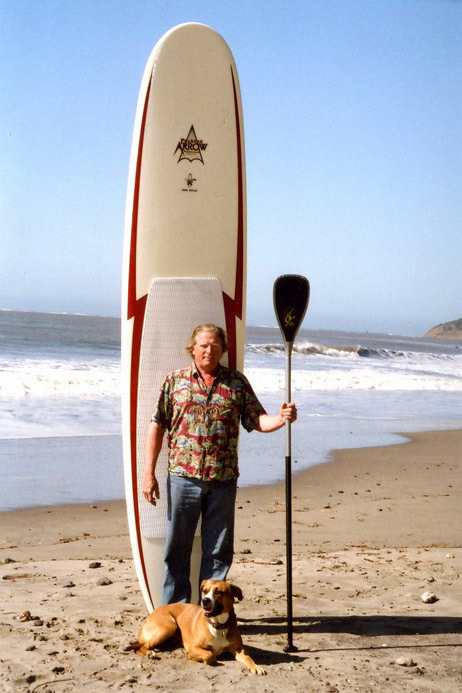 Ray was on a custom epoxy standup board shaped by Bob Pierce of Santa Cruz, (Pierce Arrow) 12' x 30" x 4 1/2" wide board with a carbon paddle. It was a clear day a couple of hours before sunset. There was little wind, 6 to 9 ft. swells were coming in, air and water temperature were about 50 F. Ray had layered a 4/3 wetsuit, covered with a shortie, hat, gloves and booties. He launched (from point #1) paddled out went well beyond the lineup of surfers to checkout waves breaking further offshore. The surfers were in two groups of about 25 each within about 150 yards of shore. The half dozen or so local standup surfers try to stay out of the main lineups and potential conflicts with surfers. It's a new sport after all and acceptance of new stuff can be slow in coming. Just ask surfers from the 1960's about what they had to deal with at times in California. Ray was about 1/4 mile out when he noticed an object well offshore to the south (around point #2). He thought it might have been a dead whale. Ray has routinely investigated such things as a marine mammal expert for years and decided to paddle out to check it out. In time it appeared to be two kayakers and still later two surfers when he was about 1/2 mile away. The two surfers were way out about 3/4 mile from shore and drifting further out. As he was staring at them wondering what they were doing so far out, one started to wave furiously. There are no lifeguards onshore at that time of year and the adjoining coastline is pretty flat. Nor was there any boat traffic in the area or any other standup riders. Ray was it and if he hadn't seen the two surfers it seems very likely that no one else would have. These guys were well out of site of the guys in the lineup. 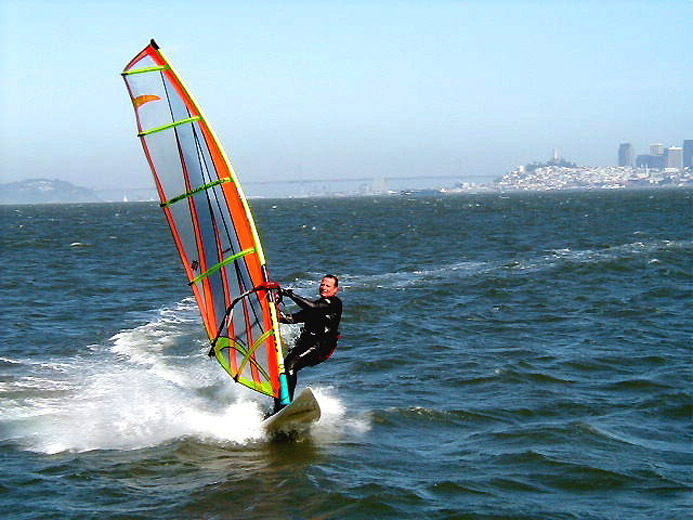 Being so high off the water, standup offers particularly good visibility to the rider just as in kiteboarding. This has contributed to other successful rescues in the past. 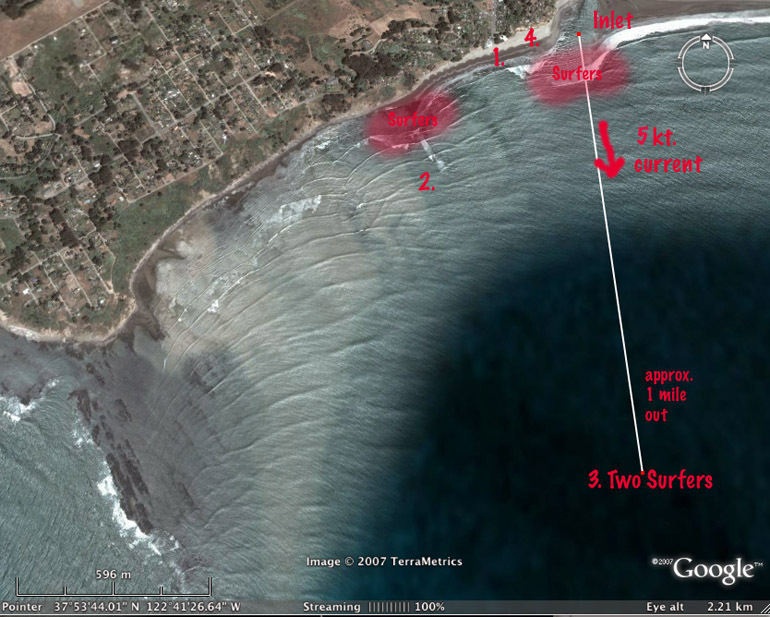 He made it out to the two surfers (around point #3) after they had drifted to about one mile from shore. They were on short boards and in their 20's. He got the impression that they were new to the area and didn't know about local conditions. They had been caught in the ripping 5 kt. ebb tide current from the cut as it rushed seaward. 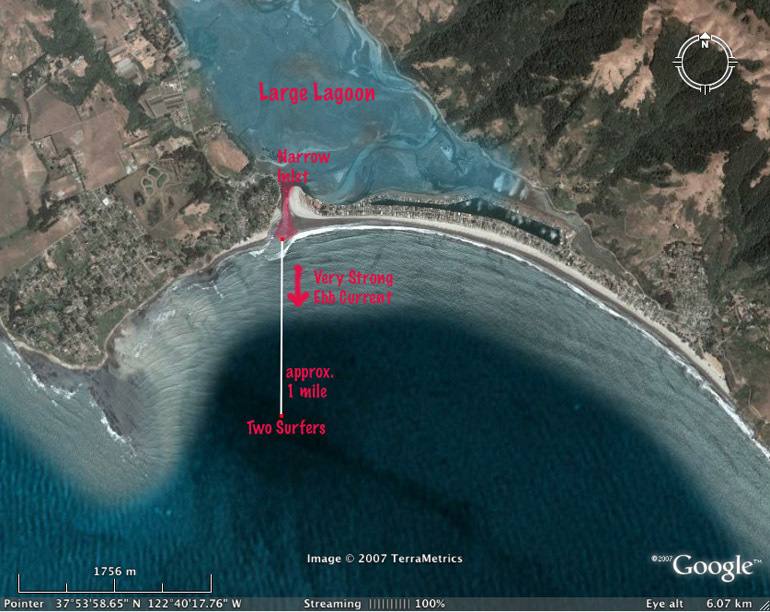 The strong tidal outflow comes from a large lagoon being squeezed through about a 100 yard wide channel through the sand spit. As in the case of most rip currents all they needed to do was paddle parallel to the shore for a hundred yards or so and they would be out of the offshore flow, able to go into shore. Unfortunately, they stayed in the westward flow and paddled hard against it until exhausted. I understand that least two other surfers had been washed out to sea in a similar fashion and lost in years past. Anyone that spends time in the water should know about rips, ebbs and how to deal with them. If there are multiple rips, make sure you don't avoid one to swim into another. One of the guys although exhausted was calm. The other surfer had been pushed too far and was freaking out, screaming that he was going to die, worrying about getting flushed out to sea and attacked by great whites. Total exhaustion, intense cold and despair for too long can do that to a person. Great white sharks are active in this area, the Red Triangle with abundant prey in seal rookeries and other marine mammals. Ray knows two surfers in the area that were attacked by great white sharks. He indicated that much outside the break nearshore it gets pretty "sharky." There are even more sharks on patrol over Duxbury Reef off the point to the west. He described seeing about a 22 footer cruise just below his boat as they as they shared a narrow cut. 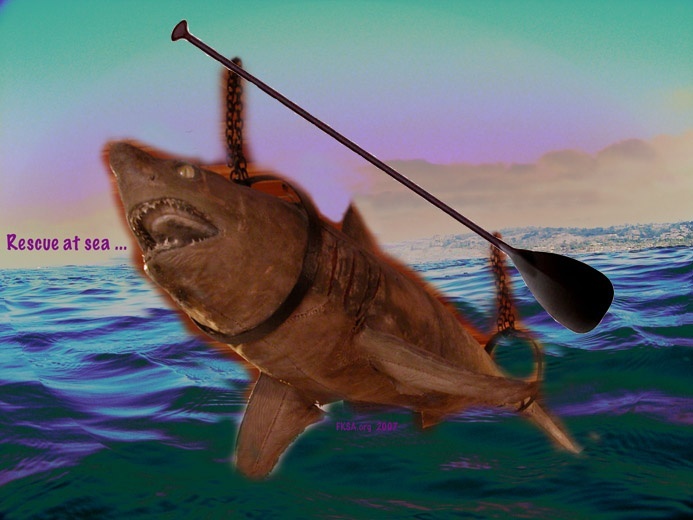 The shark was wider than his boat though! 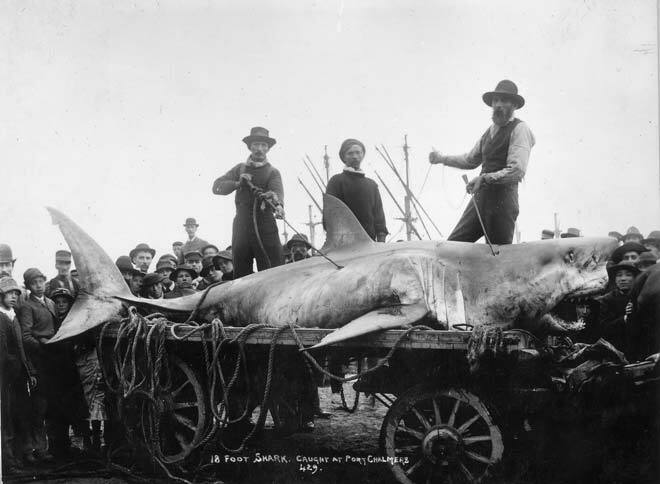 Ray indicated that whites frequently feed on dead whales offshore. He told me that they are probably seen more often than they are reported as each report leads to the beach being closed for a week or so. So, the surfers may keep the news to themselves at times to avoid closures and lost time in the surf. One of the surfers seemed to be OK but was too tired to continue paddling into shore. Ray said lets talk with your friend to try to calm him and get ready to head in. He was skeptical that he could pull all three of them very far but could see no other choice. He had the guys hang on to board leashes to aid in the towing. Ray tried to pull both riders in and himself for a while but it was too much drag resulting in his being yanked off the board repeatedly. He concluded none of them would make it in at this rate. Fortunately, the one surfer who was in better shape recovered, caught a wave and rode all the way in. Probably his best ride of that day in more than one way. Ray asked the other guy if he thought he could catch a wave too, to which he said no way. He was very upset and tired. So he took the surfer under tow parallel to the shore to try to leave the main ebb current. He kept getting jerked off his board standing up so he kneeled and eventually sat while continuing to paddle ever more slowly due to heavy mounting fatigue. Not having much else in the way of options, Ray hammered shoreward for an exhausting hour. At about 2/3's of the way to shore the break was going, head high and better. Ray said he was afraid that both of them were going to get rolled up in the breaking waves and severely pounded. He had serious concerns about making it past that point. Fortunately, the surfer let loose of the tow at the right time when a critical wave hit so they both rode over it. Ray noted that hypothermia was impacting the surfer exhibiting blue lips and hands. Ray continued the tow up to about 50 yards from the beach when the surfer caught a wave and rode in. Ray was distracted dealing with his board and by the time he made it in, both surfers had taken off without a word. He did notice the surfer he assisted fall several times from sheer exhaustion as he labored up the beach. When Ray got into shallow water, his legs wouldn't hold him up. His legs were wiped all he could do was to try to hold on to his board. He was munched pretty badly by a breaking wave which dinged part of his board against the rocky bottom. Finally he got above the water line and just sat there about 20 minutes until his legs came back (around point #4). He had covered about 3 to 4 miles in surf that day prior to the rescue adding to the fatigue. Ray had been working on using his paddle for steering in waves and bottom turns to exit waves for a couple of hours before the rescue. Dr. Ray Deiter with his standup paddle surfing rig and Tracker Joseph the beach master dog. A few days before this, Ray overheard some surfers badmouthing paddleboarders. Things like not knowing what they're doing and not being good for much. Ray has been doing standup for about six months, says he's "not very good" (uh, right). He intentionally stays away from surfers to avoid causing problems. One of the two guys that had made the comments a few days earlier came up and said "hey you saved those guys, good for you, maybe standup paddleboarding isn't such a bad thing." True, it is likely that Ray's effective actions may have saved at least one of the surfers, perhaps both. Who else was there to help? Word seems to have spread a bit so there may be some more tolerence or respect out there for standup. 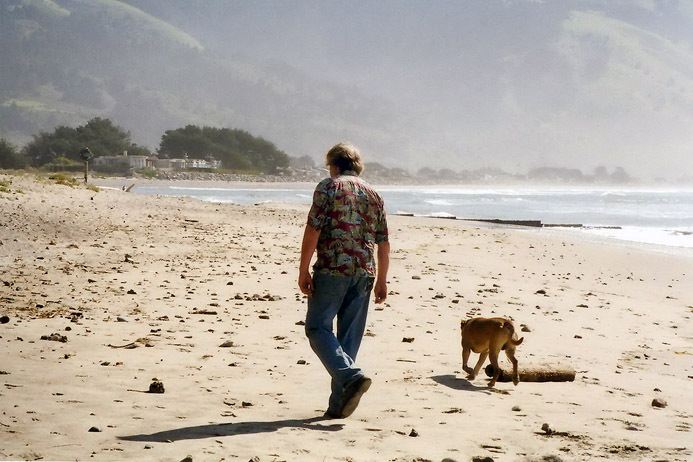 Ray, more accurately, Doctor Ray, is a veterinarian based in Sausalito, California. He used to practice in the care and treatment of Marine Mammals (dolphins, whales, seals, sea lions, etc.). There was another time in which he came to the rescue, this time to marine mammals (and a lot of other life), being maimed and drowned in gill nets laid across Norcal's bays. The senseless loss of life was appalling and taking a serious toll on impacted wildlife populations in the area. 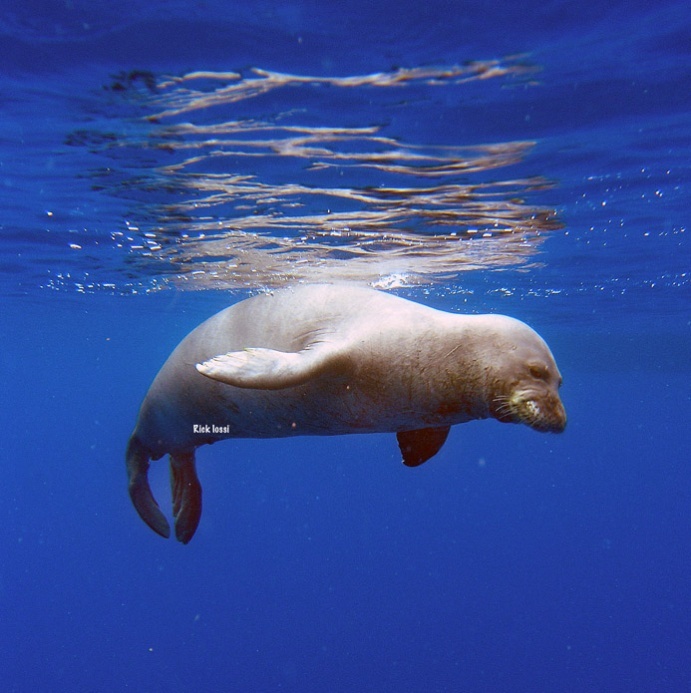 He performed necropsies (autopsies on animals) on over 500 marine mammals over 10 years to evaluate causes of death. His data was utilized by Congresswoman Barbara Boxer to ban gill netting. Many dolphins, seals, sea lions and a wide variety of other marine life were lost to gill netting in northern California, but no longer thanks to Ray and his colleagues. So, it is fair to say that Ray is a core waterman in many ways. Watermen need to be aware of what is going on and prepared to deal with things should they go wrong in an effective manner. Otherwise you might be better off staying in the pool. Ray showed how it is done and then some. Ray is active in local kiting events including racing in the Cabrinha Race Series and running support in the 53 mile circumnavigation of the Farallon Islands (a mild jaunt with 30 mph winds and 14 ft. seas). For Ray, windsurfing pulled him away from surfing, kitesurfing the waves in turn displaced windsurfing and now with standup he's gone full circle back to surfing pursuits. He may get as much stoke these days doing standup as he does kiting which is saying something. It is a great workout, using most of the muscles in your body. He spends most of his time wave sailing in all those excellent swells in the area riding year round perhaps 150 days/year by kite or surfboard! I asked Ray what the largest wave he has paddled into to date, he estimated head high and half and then it becomes too much. I wanted to know what he was currently working on to which he replied "standing up!" That is in big waves, it can sure be tough. He is also working on turning before the wave more effectively ruddering with the paddle. Ray has resolved to always have his standup board on his truck to deal with emergencies should they arise. After all they kite in areas without land phone lines or even cell coverage, no boats to speak of, out in the middle of no where. If something goes wrong there, you may well be on your own, that is unless you are lucky enough to get a hand from Ray. Laird Hamilton does standup too. Nearing the end of the interview in April 2007, Ray was anxious to get off the phone. The surf was running head high with winds 20 to 25 kts.. His kites were calling him to hit it. Hope you had a great session Ray, you've earned it! Last edited by RickI; 09-03-2012 at 09:37 AM. way to go for him indeed. I was wondering what you guys thought about the original opening shot below. The one I chose was a slightly doctored photo from SoCal. There was only one guy, it wasn't all that gloomy and he wasn't in trouble or descending into an architectural "vanishing point." Still, I felt lucky to find it having spent only a single long weekend in California. This is a composite of some strange stuff. 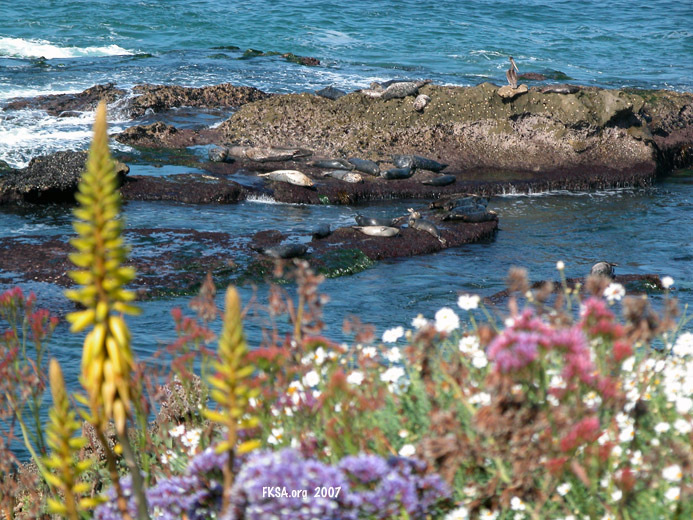 The altered backdrop is a free diving level shot off La Jolla when I was looking to photograph some seals. No joy on that, one just bounced up behind me for a verbal goose before vanishing. 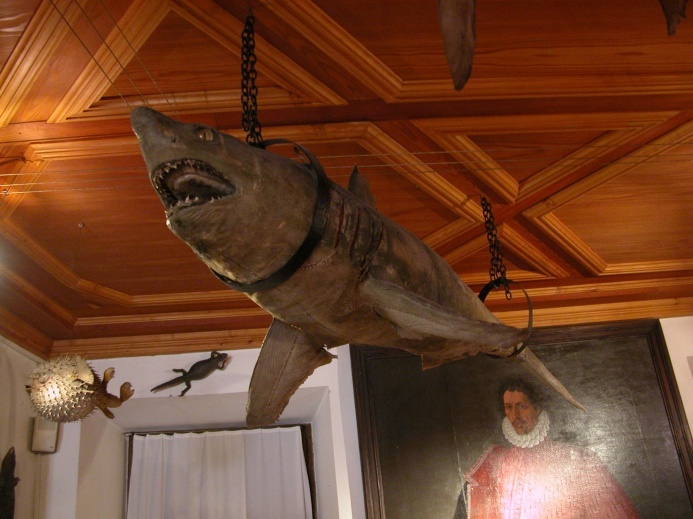 The stuffed shark lives outside Innsbruck, Austria in Schloss Ambras along with some other interesting/strange museum pieces. Our tiburon bud, hanging around. I would sue the plastic surgeon that put those stitches in. So, which is better, the one that was used or the latter one? I wanted to bring this post back to the top. What other SUP rescues have you heard about?